Medium vigoour open plant, setting clusters every 25 cm. 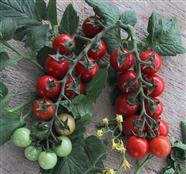 The deep red round jointed fruits, average 18-22 gr. in weight. Julie F1 is a high yielder, and is suitable for both single and cluster harvest. Crack-free variety, even under adverse climatic conditions.